As WordPress has continued to grow, WordPress themes have become more complex in what they can achieve – many developers are now allowing end-users more control over the layout of their websites by adding in Drag & Drop Page Builders functionality. These allow you to rearrange elements of your pages visually by dragging elements to their desired position, customizing and styling those elements and adding new ones where needed. By doing so, you are not tied into the layout for each page that the developer has chosen, so you can build your website and individual pages just they way you want. Why use a Page Builder Theme? 1 Why use a Page Builder Theme? Themes which include a page builder are great for beginners or people with a low budget for their website who wish to have unique layouts and pages as they allow anyone to use the builder to create layouts visually with a WYSIWYG ( what you see, is what you get ) approach which does not need any knowledge of HTML, CSS or other coding, this means you don’t have to hire a design company to create these pages for you. A visual page builder will allow you to create columns and rows and insert different pieces of content, images and other elements like tabs, videos, tables, sliders and so on. Using a theme with a page builder enables you full control over the design of your website also, you can change headers, footers, content sections as you wish and also customize the colors, background images etc. Another use for a page builder theme is to create landing pages, you can build a page which is optimized for advertising campaigns from Google Adwords or Facebook etc which directs the user to signup for your mailing list or download a product such as an eBook and then add their details to your mailing list or sales funnel. In this roundup, we have gathered together all the Best Drag & Drop Page Builder WordPress Themes which are currently available. Choose one of these themes and you can build your own website just the way you want it with an intuitive visual builder. 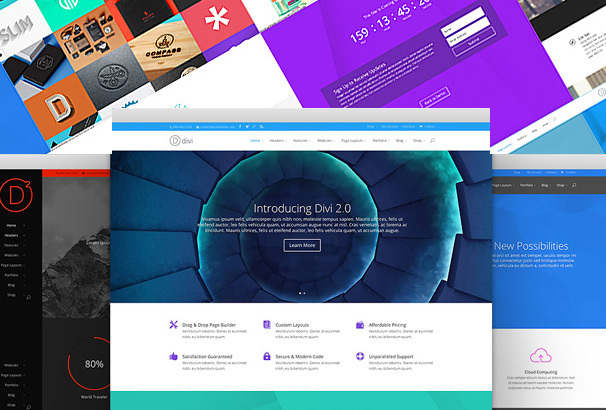 Designed to ensure the ultimate user experience, The Divi Builder is one of the best website themes that we have. Using this builder you get to combine different elements and create your very own unique website. Without even touching a single line of code, using this theme you get to create a highly personalized and professional website for yourself. One of the most flexible website themes that ElegantThemes have created, this dynamic theme lets you create an amazing website very easily using a drag and drop interface. For all the people that want to create an amazing and versatile website, Monstroid is the perfect theme. This multipurpose website theme comes with all the features that you can possibly want. Monstroid has a number of predefined pages and around 12 child themes. In addition to that is also comes with 23 pages that are built in. Monstroid is a multipurpose and very functional theme that helps you create an amazing website. With the combined power of the Divi Builder and the powerful drag and drop builder, Extra has the ability to create the most amazing website for you. This theme comes with a set of pre-made modules and focuses on creating not only a great website but also one that is highly customizable. The homepage for this theme is really engaging and attractive and captures the attention of all your viewers. One Page is a really unique and creative website theme designed to help you create a really sophisticated website. With the amazing power of the drag and drop builder, One Page has a distinct single main page design that displays all your imagery and content there. The headers are really organized and help systematize your website. The main slider is lively and creative and helps bring your website to life. 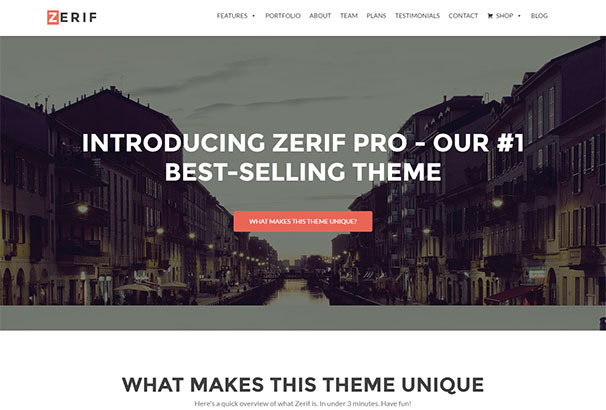 Zerif Pro is a really multipurpose website theme with a really engaging and responsive interface. Designed to be mobile friendly, this website theme is compatible with all devices and runs with an amazing speed. With its amazing drag and drop builder, Zerif Pro allows you to create unique and fantastic pages in practically no time at all. This theme is compatible with the SiteOrigin page builder as well and is one of the most practical themes we have. It also comes with WooCommerce integration using which you can run your own online store. 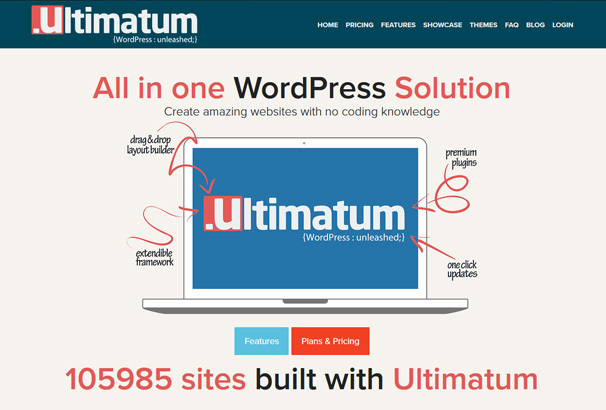 Ultimatum is a website theme that comes with a really creative and unique interface. Built on the amazing drag and drop builder this theme allows you to create an amazing website for yourself that is highly efficient. Using this theme you are not bound to use any widgets at all and can make use of any plugins you like according to your preferences. By dragging and dropping elements to your desired position in the page, Ultimatum lets you create a highly individualistic website. 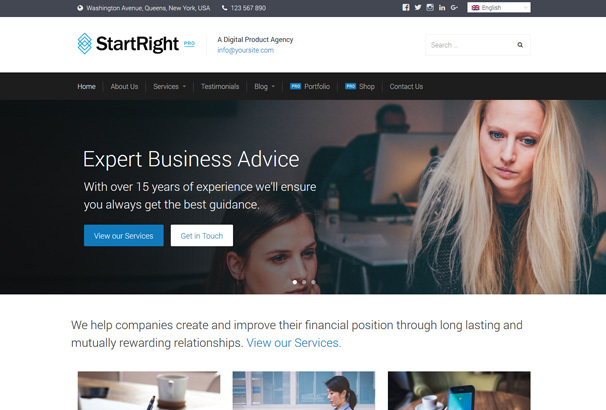 Start Right Pro is a really professional and contemporary website theme. 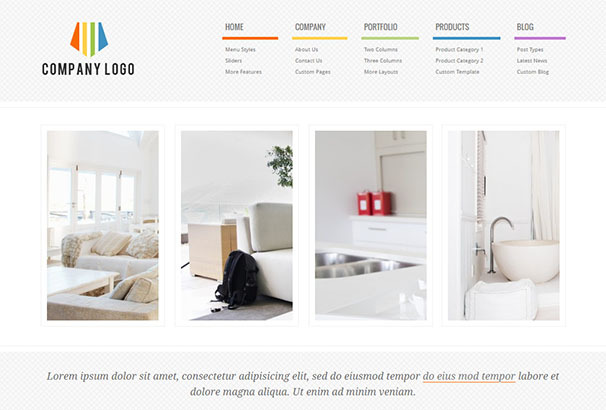 This theme has a really simplistic and minimal interface that displays your content in a really charming way. This business website is perfect for all users be it amateurs or professionals. 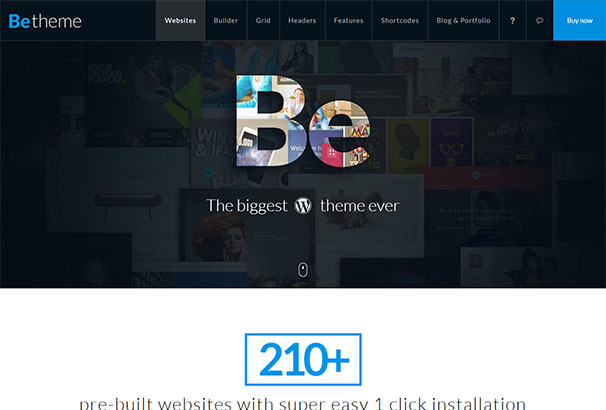 With this theme you can create a really striking and amazing website for yourself. In addition to that this theme runs amazingly on all devices with a high speed. 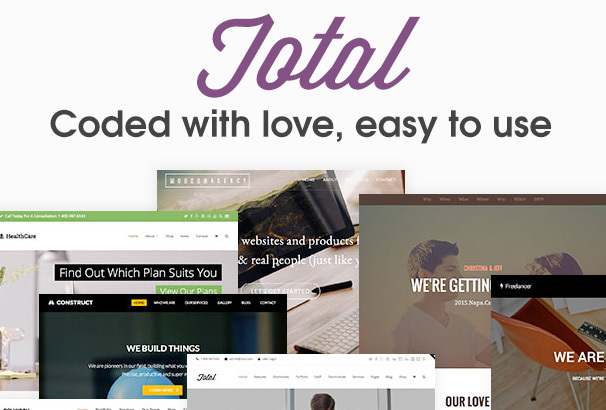 Total is a really modern website theme that combines both style and efficiency making it the complete package. Built on the drag and drop builder this website theme allows you to create a unique and distinctive website. Total has a really clean and minimal interface which is really attractive and sophisticated. In addition to its amazing design this theme also has a great speed and is compatible with all devices and screen sizes. Headway has a really amazing interface and functionality that is often unmatched. Using this theme’s powerful Visual Editor you can create a really powerful and amazing website. 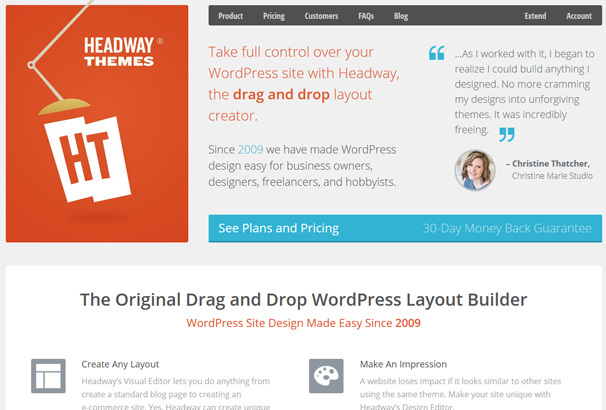 The perfect theme for a blog or an e-commerce website, Headway create amazing and unique layouts for all your pages. The main slider allows you to display as much content as possible while minimizing the clutter and gimmicks. 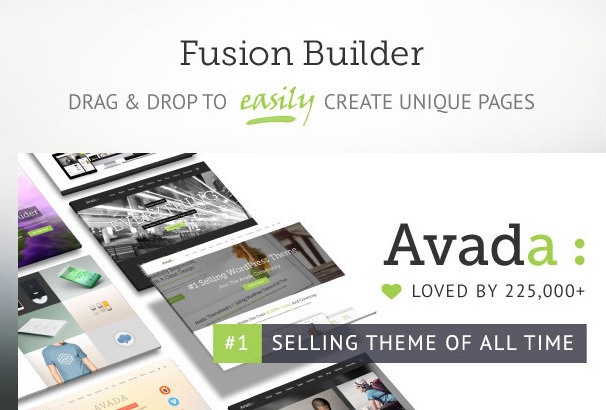 Avada is one of our best number one selling website themes. The most versatile and dynamic website theme, Avada is really multipurpose and is perfect for all sorts of content. It has a really elegant and simple interface that doesn’t display too many things on the main page. In addition to that with its drag and drop builder all you need to do is drag elements and drop them to create unique and amazing pages. 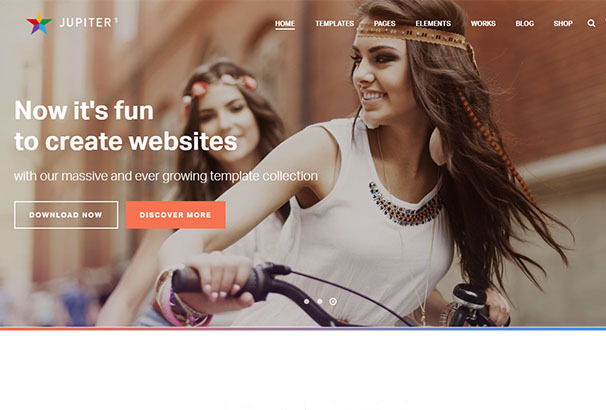 With over 28,000 active users, Jupiter is one of the best website themes that we have. The perfect theme for every user be it for a business website, a blog or an online store, Jupiter has everything you need. Built on the amazing drag and drop builder this theme helps you combine elements and create unique and distinct pages. It has a really responsive and retina ready interface. In addition to that Jupiter is also SEO optimized so you don’t have to worry about the popularity of your page either. 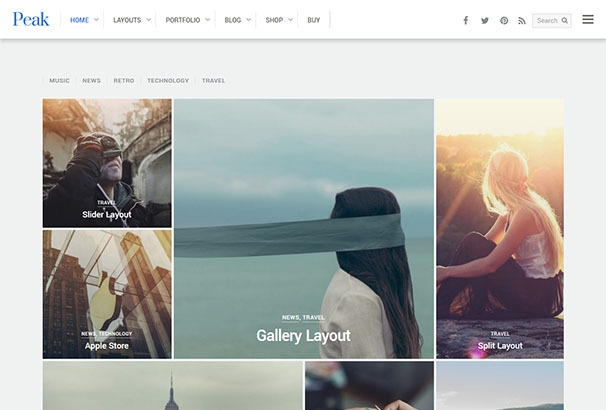 One of the most user friendly and easy to use website themes, Layers was created to be the most professional theme. 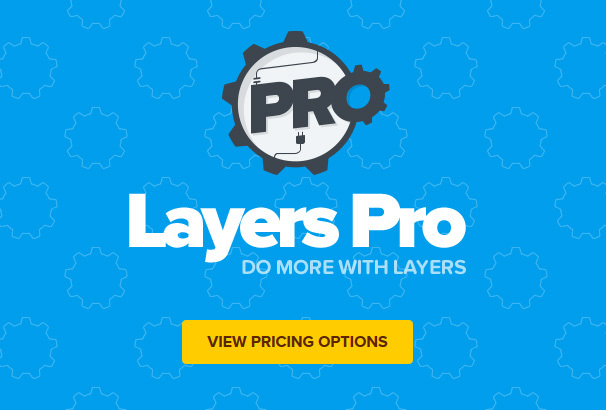 Built with tight parameters to help all the new users, Layers Pro comes not only with an amazing interface but also high speed and efficiency. Built on the powerful drag and drop builder, this theme allows you to create a really practical and easy to use website. Without even touching a single line of code, using the Beaver Builder you get to create a highly fantastic website for yourself. The Beaver Builder is a really efficient and flexible website theme. The perfect theme for a professional website, whether you’re a beginner or a professional, using this theme you get the perfect blend of style and efficiency. 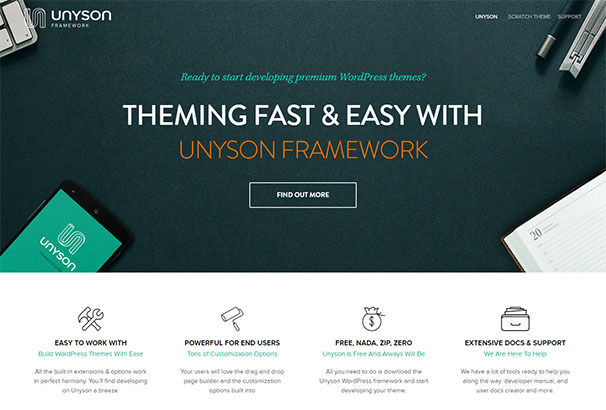 Unyson Framework is a really fast and user friendly website theme. Built on the amazing drag and drop builder this theme allows all its users to create countless amazing pages and generate shortcodes as well. In addition to that this theme also comes with a built-in content demo installation feature using which all your users can easily install the content of the theme when it is displayed on the theme demo site. 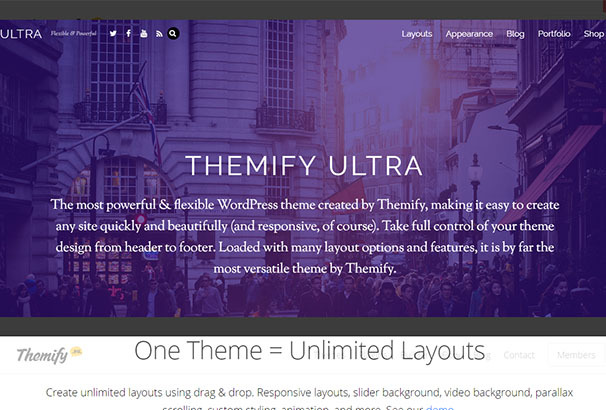 Ultra is a really modern and powerful website theme by Themify. Using this theme you can create really flexible and attractive pages for your website which are highly responsive and engaging as well. From the header to the footer, every tiny detail of your website is directly in your control. The perfect theme for developers and designers, Ultra has both the design and the practicality. Built on the powerful drag and drop builder, this theme has a lot of amazing features including a slider background, video background, parallax scrolling, animation, custom stylish and a super responsive layout. 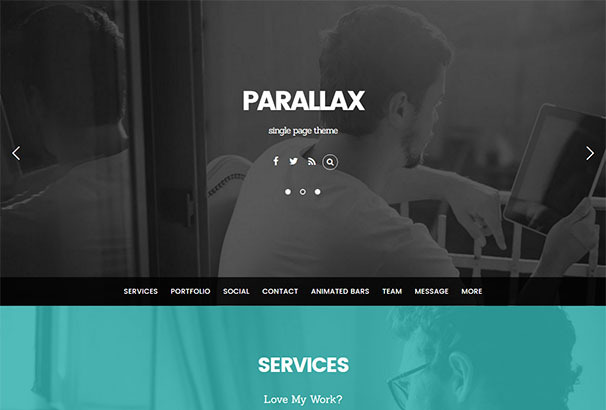 The Parallax website theme is the perfect blend of two amazing trends which are the single-page design and the parallax scrolling. This contemporary website theme has a really cool and chic interface which draws your users towards it. 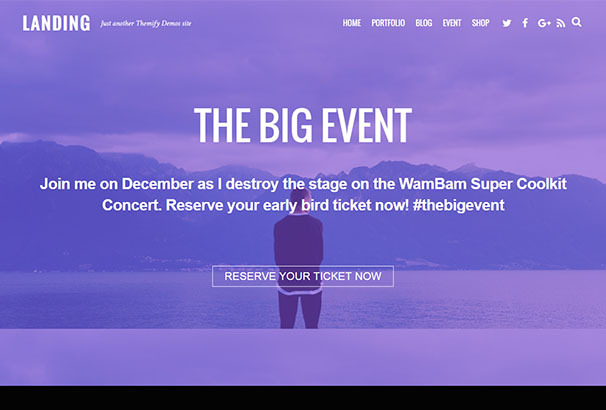 In addition to the beautiful single page design the Parallax scrolling makes your content shine even more with its fly-in elements. Using this theme you can create any kind of layout for yourself with the line preview on the front-end. Landing is a really stylish and contemporary website theme that helps you create a really professional and modern website. This theme is special for its effective landing page design which increases the site conversion. In addition to the design, the theme is built on the drag and drop builder and combines different elements to create a really unique and distinctive website. With a number of header options you can customize your website however you like. It also comes with 23 amazing layout options that you can import to your website with just one click. This website theme is highly multipurpose. From a blog to portfolio or even an online store, this theme is perfect for all uses. 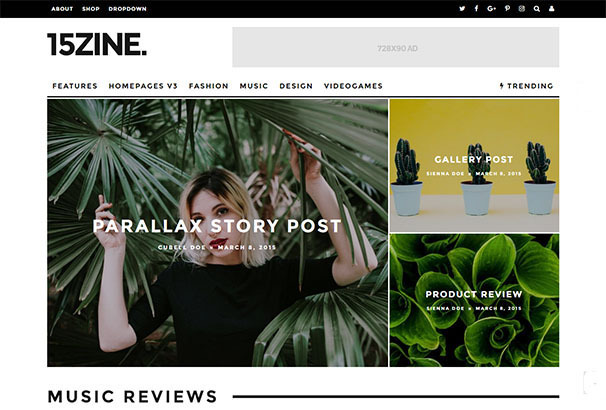 A really contemporary and cutting edge website theme, 15Zine was built with both an amazing design and high practicality. This theme as well is built on the powerful and user friendly drag and drop builder that helps users create pages with extreme easy and flexibility. Using this impeccable theme you get to weave a story with your content and captivate your viewers. In addition to everything the theme also comes with a wonderful image style system that uses multiple feature image style to create a wonderful website. 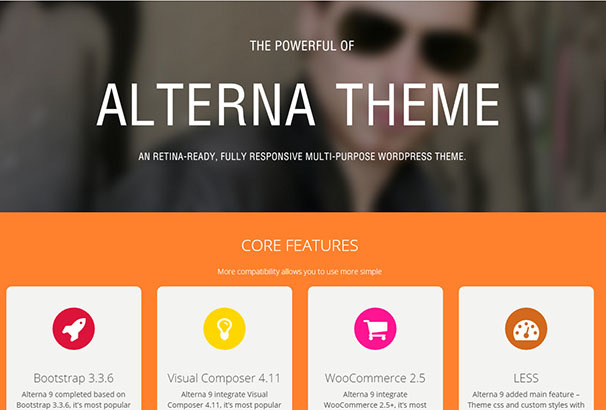 Alterna is a really modern and contemporary website theme. It is a highly multipurpose website theme that helps you create a really beautiful website for yourself without even touching a single line of code. Alterna is highly versatile and serves as the perfect theme for a business, corporate, blog, magazine or portfolio website as well. Combining the powers of the Bootstrap 3.3.6, The Visual Composer and WooCommerce integration, Alterna is the perfect website suitable for all users. BeTheme is a really versatile and contemporary website theme that allows you to create your very own unique website. Be it for a business website, a blog, a portfolio or even an online store, BeTheme allows you to create a really amazing website. With unlimited possibilities you get to combine and mix and match elements to truly create a distinct website for yourself. BeTheme also comes with fifteen built-in websites to truly show your viewers what your website is all about. Combining the efficient practicality of the Visual Composer and its add-on, Impreza is a highly practical multipurpose website theme. It has a really subtle and colourful interface that is not only highly attractive but also very engaging. 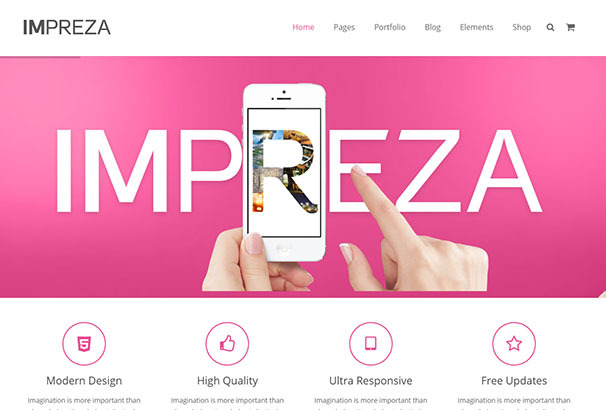 In addition to the design Impreza also comes with a lot of amazing features including WooCommerce integration making this theme a favourite for all the people that love efficiency and practicality. A contemporary grid based them, Peak has an amazingly modern design. With a masonry tiles layout this theme is adaptable to every devices and fits all screen sizes. Using this layout you can display most of your content on the main slider and make use of the space the way you want. The theme comes with an optional mega menu, a number of post layouts, portfolio section, slide-out widget and to top it all off it is also WooCommerce integrated. With parallax scrolling, animations and background video, Peak has everything that you could possibly want and more. 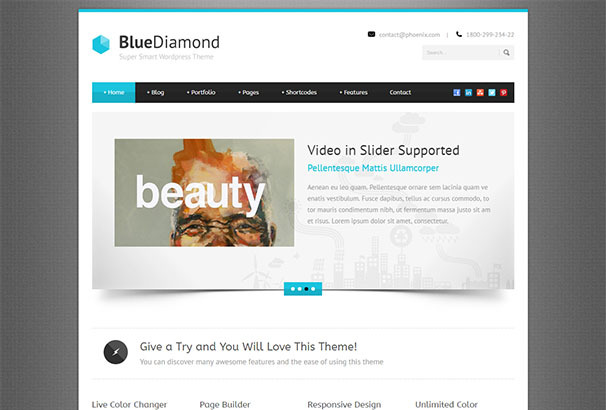 The premium business website theme, Blue Diamond has all that a business website could possibly require. From a really responsive and engaging website interface to amazing features, Blue Diamond is one of the most efficient themes that we have. With the Page Builder you can create as many pages as you like according to your own liking and it also has the drag and drop builder making it one of the best themes we have ever made. 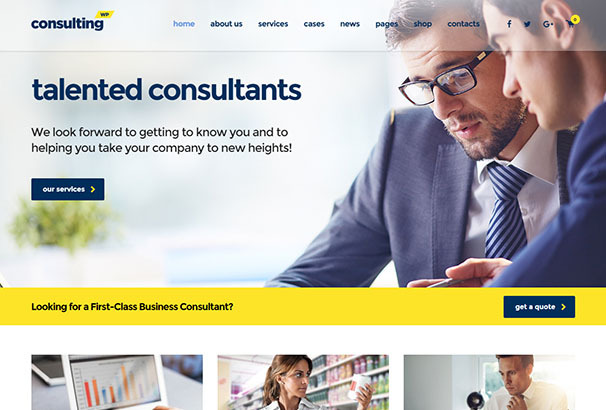 For a business, firm, agency or a consultancy firm, Consulting is the ultimate website theme that has got all your needs covered. 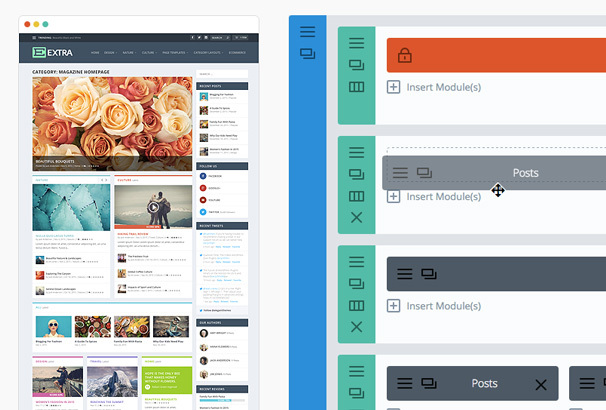 Using this theme you can easily upload and manage your content and organize it to your liking. With the drag and drop builder you can combine elements and create unique and distinctive pages. In addition to that the theme is also WooCommerce integrated and allows you now only to showcase your services but your products as well. The most complete and ideal environmental website, Earth is the perfect combination of a great outlook and wonderful functionality. 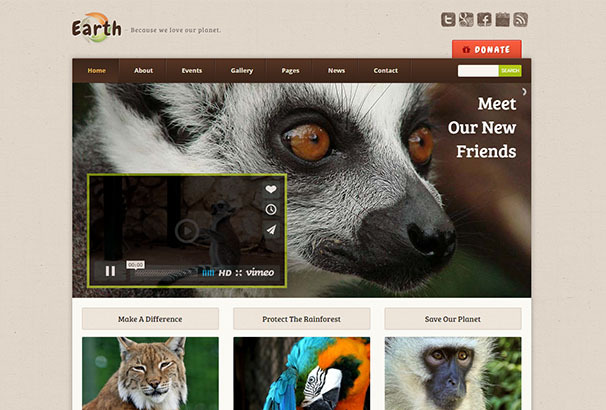 This theme comes with a really responsive interface and is perfect for all professional and non profit users. This drag and drop builder theme comes with a lot of amazing features including an event calendar, a gallery type post, a blog section and a donate button as well. The theme has a retina-ready layout and runs amazingly on all devices and screen sizes. 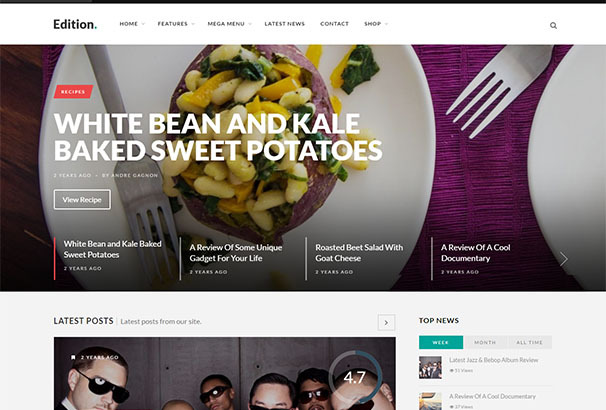 Edition is a really contemporary and modern website theme for pretty much all sorts of content in particular food websites, blog sites and review sites owing to its built-in review system. For all the people that value imagery, using this theme they can add charming photographs to their website making it really charming. 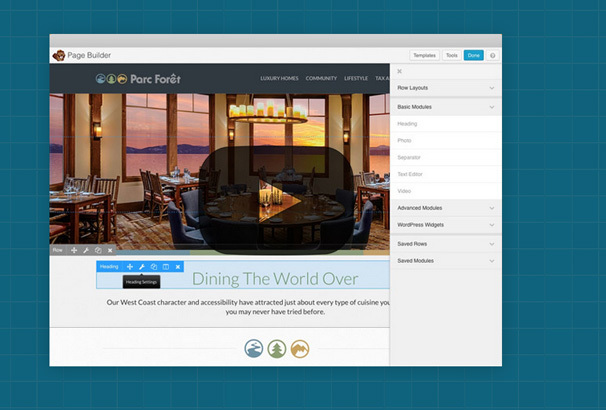 With the drag and drop builder you get to create custom stunning page layouts and make your website truly your own. The ideal theme for an online-store, GoodStore comes with the Visual Page Builder and allows you to create aesthetically pleasing, stunning layouts. In addition to that this theme also comes with the drag and drop builder and WooCommerce integration making it one of the most powerful themes that we have. 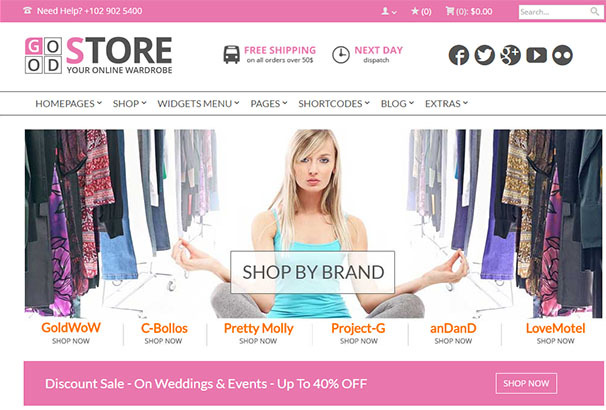 Using this theme you can quickly create stunning layouts and pages without even touching a single line of code and create your very own impeccable online store. 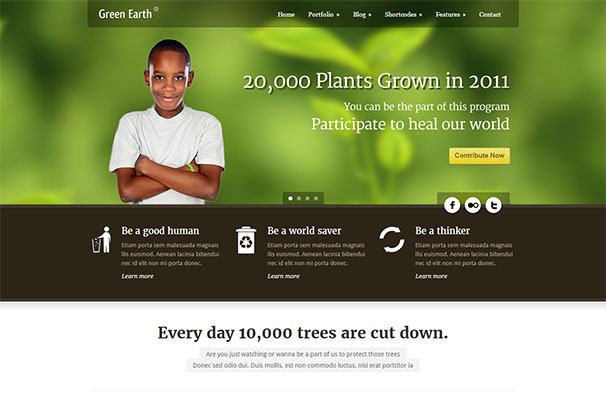 Green Earth is one of our best environmental websites. This theme is versatile in the sense that it can be used by anyone be it businesses, agencies, freelancers or nonprofits. Using the drag and drop builder you create your very own distinct pages while owing to the custom slider you manage your main slider however you want. This ready to use theme requires no work and no time and helps you build the ultimate website. 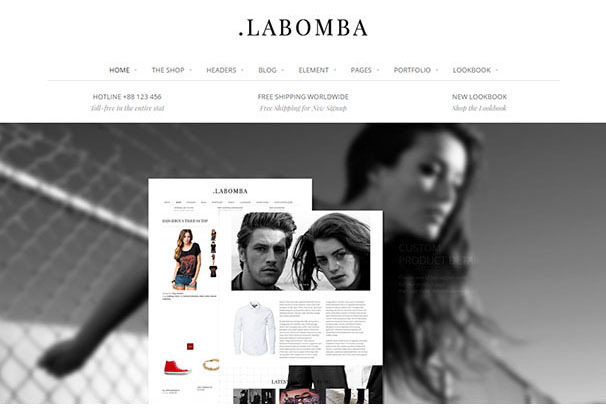 Labomba is a website theme built with WooCommerce integration. With a number of amazing features and the most classy and subtle interface this website theme is trendy to say the least. This multipurpose website theme helps you create the most flexible website suited for all sorts of content be it a portfolio, a blog or a fashion store. The classy black and white design with the high speed and efficiency make Labomba the perfect website theme. 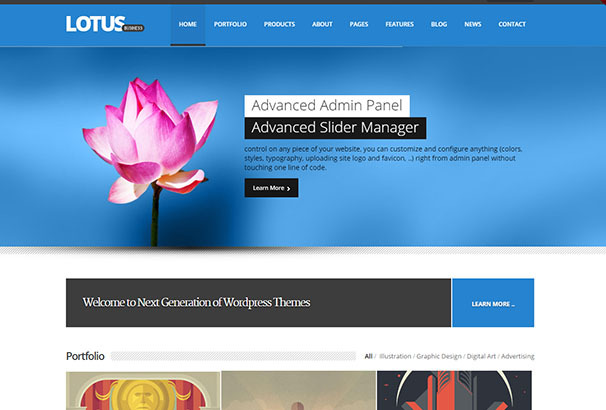 One of the most multipurpose and flexible website themes that we have, Lotus comes not only with a really clean and fresh interface, it also comes with a lot of features and tools. Using Lotus you get to create the ultimate website for yourself on which you can upload whatever content you want. With the powerful drag and drop builder you can create your website in a truly individualistic and distinct way. An e-commerce website theme build on the powerful WooCommerce plugin, this theme has the speed and power that most desire for their online store. 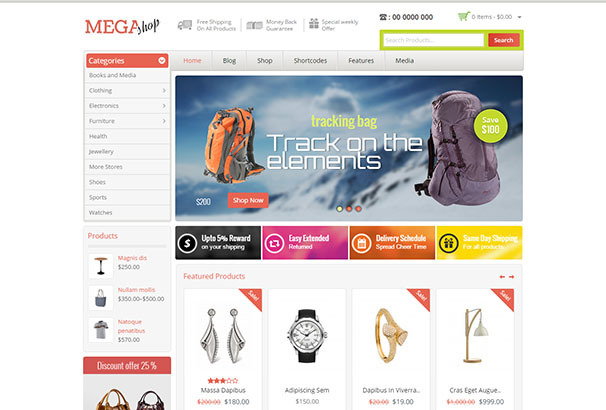 The perfect theme for cosmetics, electronics, accessories, mega stores and all multipurpose online stores, this flexible theme has both the interface and the organization to make it one of the best themes for every kind of use. 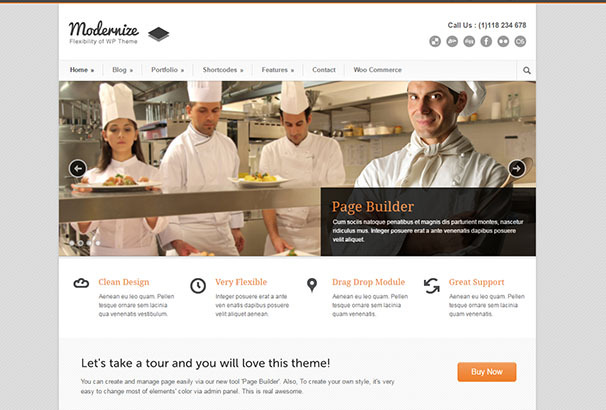 Modernize is a website theme using which you really get to make the ultimate statement. With a really elegant and sophisticated interface, Modernize really appeals to all the viewers and captivates them. In addition to its design this theme comes with the drag and drop builder and WooCommerce as well making it one of the strongest, most powerful themes that we have. This theme helps you create the ultimate website that oozes professionalism. 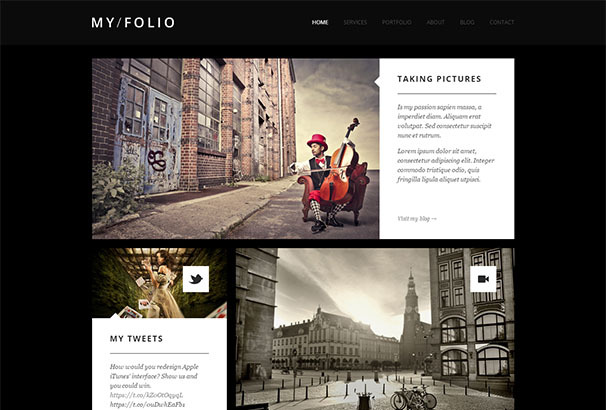 My Folio is the perfect website theme for portfolios and blogs. This simple and minimal website theme comes with a really subtle and sophisticated interface and comes with a lot of amazing features as well. Using this theme you get to create a really clean and organized website for yourself that is perfect for all sorts of content. 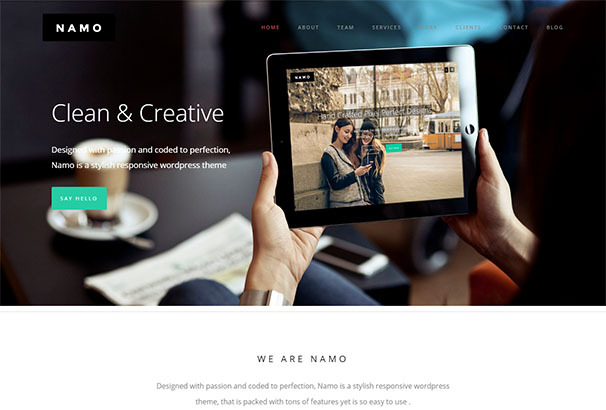 Namo is one of the most sophisticated and contemporary website themes that we have. This theme comes with a really responsive and engaging interface that displays your content in a really charming way. In addition to the outlook the theme also comes with a lot of powerful features including the drag and drop builder using which you can create a unique and creative website for yourself. 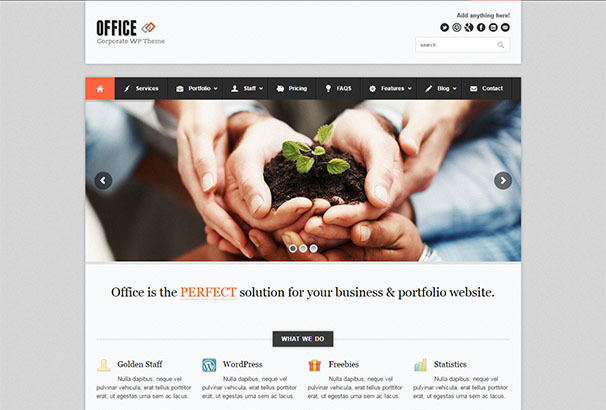 Office is the a WordPress theme for any corporate business. Featuring a very professional design, 7 custom post types, drag and drop homepage modules, unlimited highlight color option, optional navigation icons, 3 menu regions, an optional responsive layout…Office has everything you’ll want for your business website. 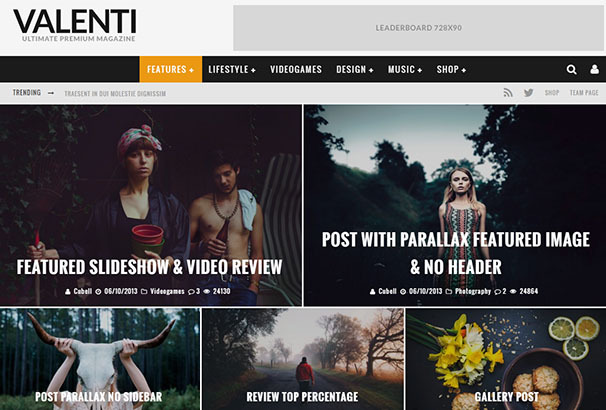 This next generation website theme has a really clean, modern and contemporary interface. With the amazing Swift Page Builder you get to create your pages and your content in a very unique way very easily and in no time at all. Whatever the content and whatever the project, you get to use this theme in a really versatile and flexible way that is perfect for all users. RT-Theme 16 is one of the best most simplistic themes that we have. Built on the powerful CMS tools admin panel, this theme allows you to create a website for yourself that is highly multipurpose and flexible. 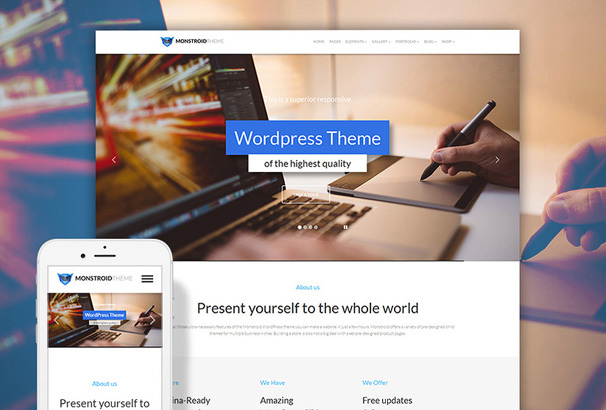 Perfect for portfolios, product catalogues, business or corporate use or even a blog website, this theme has both the functionality and the interface to make it one of our best professional website themes. 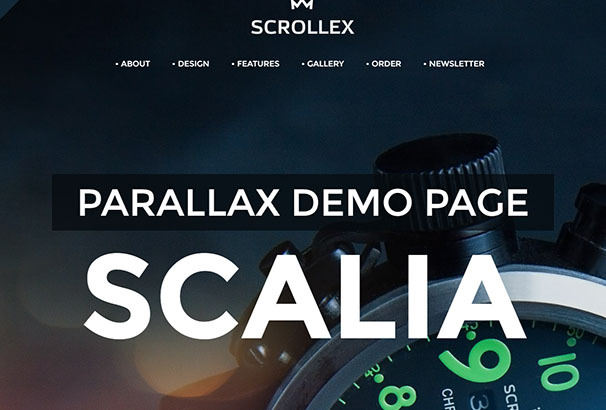 A really contemporary website theme, Scalia comes with a really creative and stylish interface. With its black colour scheme and an amazing header layout Scalia has everything that you want. 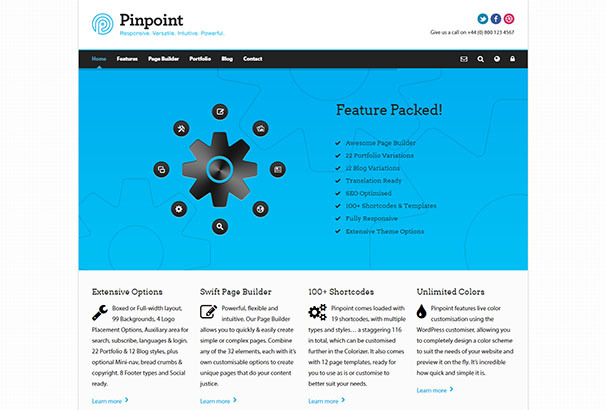 In addition to its amazing design this website theme also comes with a lot of great features. With the drag and drop builder and WooCommerce integration, Scalia helps you build a flexible and highly customizable website. SmartMag is a really flexible and versatile website theme combining the power of the admin back-end and the front-end usability. With the power of the drag and drop builder this theme helps you create an amazing website. The theme is also SEO optimized and is built on the HTML technology. 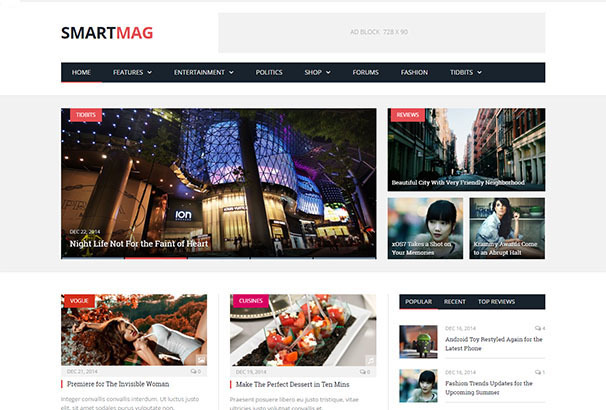 An engaging interface paired with high efficiency and speed, SmartMag is an amazing website theme. 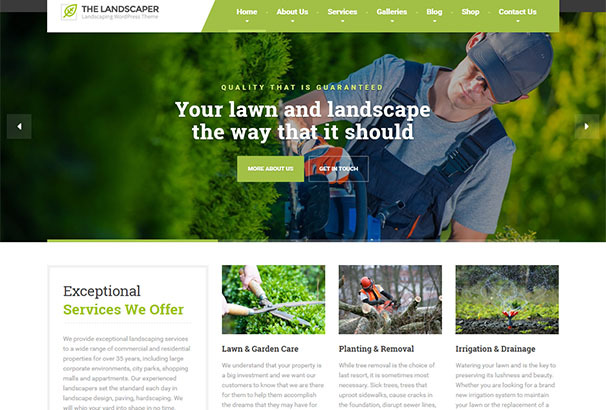 The ultimate website theme for lawn services businesses, landscaping companies, landscape architects, gardeners, florists or agriculture companies, The Landscaper has everything that is perfect for all such uses. Using the demo importer that comes with this theme you can easily and quickly create your website theme within minutes. Built on the powerful drag and drop builder you can combine elements and build your website however you like. In addition to that the theme is also WooCommerce integrated making it very flexible. One of the best and most ideal themes that we have for photography, Vega Theme showcases image-based content in a really stylish and appealing way. The content builder that this theme comes with allows users to create multiple image galleries for photographs. Its drag and drop builder combines different elements to create a creative and unique website. Not only does it have a really responsive interface this theme also comes with WooCommerce integration making it one of the best themes that we have.